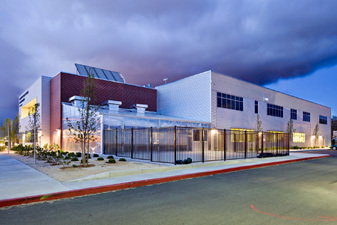 DESIGN ACADEMY OF ARTS, CAREERS AND TECHNOLOGY (AACT) at 380 Edison Way houses the School Districts' advanced learning center.Technical Designs provided the mechanical and plumbing design services for this 50,000 square foot facility expansion / upgrade. This building is an educational facility that will allow for student interaction with the mechanical systems that serve their environment. With this goal in mind, the mechanical systems will demonstrate the most common HVAC systems that employed throughout the School District. The building will be served by two system types: 1) water source heat pumps for a portion of the building and packaged rooftop VAV with series fan powered VAV terminals with hot water reheat. The actual division of the systems is based on programmed usage of various spaces within the building. The water source heat pump system is based on roof mounted units with 100% outdoor air economizers. The additional heat required will be added to the condenser water loop with a plate and frame heat exchanger interface with the building’s hydronic hot water system. A small closed circuit cooling tower handles the heat rejection from the condenser loop. Packaged rooftop VAV with series fan powered VAV terminal reheat units serve a portion of the building. The roof unit has a full air side economizer with powered exhaust and a VFD driven supply fan. There are three kitchen areas: Bakery, Teaching Kitchen, and Demostration Kitchen with various Type 1 and 2 exhaust hoods with dedicated make up air systems. The make up air units are evaporative cooling assisted and indirect gas fired heating.